The food industry just won’t quit. In a time where New York City is posting calorie counts on it’s menus and opening bike lanes, it’s mind boggling that the rest of the world seems to be engaged in a sandwich gross out contest. Next up in our lineup of disgusting culinary marvels, is Denny’s, with not one but two new high cholesterol, high calorie creations. First up, the Fried Cheese Melt. As part of a value priced menu, this little ditty is only $4.00 and consists of “ four fried mozzarella sticks and melted American cheese between 2 slices of sourdough bread. It is served with French fries, and a side of marinara sauce.” So it’s basically breaded fried cheese, with cheese, and bread that gets re-fried. Oh, and then there is the sauce! But what about something for the little ones? 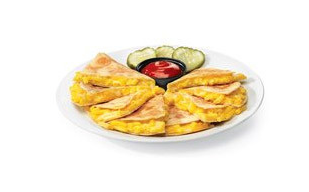 Denny’s has a Mac and Cheese quesadilla for them! It comes with dessert and a drink and boasts 2300 calories!! According to Denny’s you can add bacon or a “Friendly frank” to enhance the offering . You can also choose from lots of great beverages such as “Cotton Candy juice” as well. 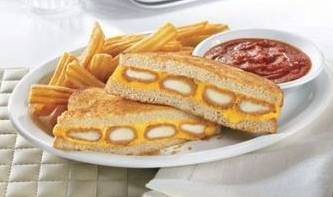 Tags: Denny's, Fried Cheese Melt, Mac and Cheese Quesadilla, sandwich gross out contest. This entry was posted on August 12, 2010 at 1:47 am and is filed under Food. You can follow any responses to this entry through the RSS 2.0 feed. You can leave a response, or trackback from your own site. Indigo, I’m so glad you brought this to our attention. It’s the height of disgusting. A couple of years back there was a Saturday Night Live spoof of a Taco Bell ad for a quesadilla wrapped in a taco, enrobed in cheese, coated in ground beef and deep fried….UGH. The whole thing is totally revolting. My take on the problem is the same as it’s always been. People need to not fear their kitchens and the word “cooking”–it’s not a production it’s a pleasure. The culture of sitting down to meals is worthwhile and just as important as sending out that last email, or working out or anything else. We need to engage our children in the process and planning–OK I’ll get off my soapbox…but this stuff makes me ill. If we could embrace that as a culture then the Mac and Cheese Quesadilla and Fried Cheese Melt would be RIPing …….